October is a celebratory month in my family because there are 4 birthdays including mine. This past weekend, I celebrated my birthday with succulent stonecrabs and delicious bubblies, in the company of my amazing family. I do realize I’m getting a “little”older, but I refuse to grow up, because age is just a number. The important thing is that I feel good, both physically and mentally. In my family, we celebrate with food and wine, and this year, they decided to take me out for deliciously mouth-watering stone crabs. The season just started here in South Florida, and it runs from October 15th through May 15th of the following year. Stone crabs are usually served chilled with a mustard sauce, and already cracked for your convenience. We went to Billy’s Stonecrabs in Hollywood and had a fantastic time. The decor is very modern and romantic, and has a fabulous view of the Intracoastal. The seafood is always fresh and delicious. The stone crabs are succulent with the mustard sauce. I also use some lemons at times (instead of the mustard sauce) which is as tasty. A little secret to keep in mind, take it easy on the mustard sauce, otherwise, you will get filled up on it and eat less crabs. Most of my family ordered, “all you can eat” and we paired them with sparkling wine and Champagne. It was a match made in heaven, and we all had a feast. Our waiter Wilson took very good care of us and made the evening enjoyable. I highly recommend this place for special occasions. “What a grand thing, to be loved! What a grander thing still, to love!” ~ Victor Hugo. P.S. 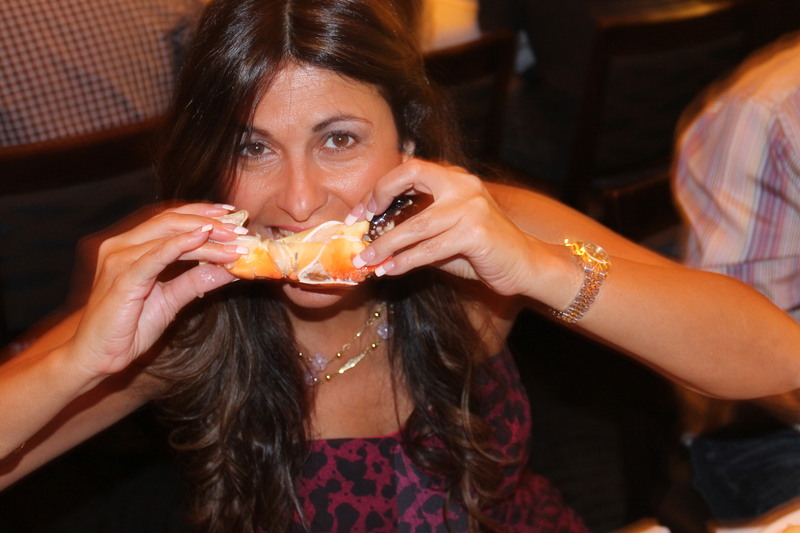 I like my stone crabs with drawn butter…still pairs well with champagne! Angela, thank you for your heartwarming comment that makes me feel so special. It is a nice feeling to love and be loved! Butter and Champagne go with everything 😃! It is so heartening to see you celebrating with your family Gina and enjoying your Birthday at such a lovely place. Your description of Stone Crabs is enticing and how graceful you are on yet another coming of age. Awww, how wonderful to see you on here Marusja sweets. Thank you for your lovely words and your beautiful frienship dear one <3!